Remodeling a luxury home in Charlotte can sometimes turn into an adventure since one thing that characterizes this city is the outstanding luxury houses and a particular kind of urbanism. Charlotte is the largest city in the state of North Carolina and it has excellent luxury home builders. Luxury has more to do with design than with large amounts of money, and also with bringing spaces to life using unique pieces as well as being equipped with furniture of high quality. It is important to seek advice from experienced house builders before deciding which design concept you really want to achieve for your house. 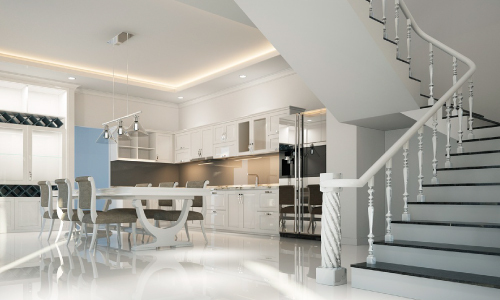 Here are 10 interesting things you can put into practice for remodeling a luxury home. Increase the lighting in your living room: as we’re talking about the inside of a house the first step is to hire an experienced interior designer so you can have access to that special design you dream about. Change the presentation of the kitchen: The kitchen is one of the most important areas in a house, you’ll need the services of an architect to do this so he can advise you on how to maintain the structure of the house. The remodeling of the kitchen must contribute with the house’s original style, for which you’ll need custom home builders for those details. Substitute strong colors on the walls with light colors: it will give the sensation of clean, spacious and simple spaces which is a synonym of good taste and elegance. Luxury homes show off open spaces, good lighting, and balance among the utilized colors. Change your current furniture for modern ones: although you can also use classic furniture with simple smooth lines and polished finishes. The most recommendable advice to remodel a luxury house is to avoid using traditional furniture. Renovate the bathroom by turning it more contemporary: look for avant-garde builders, there are simple keys to make a bathroom look luxurious and trendy, lamps and mirrors are modern accessories that will give your bathroom a contemporary look. Use key materials to remodel luxury homes: in home building, a great quantity of materials is managed and they often allow us to identify a project, nevertheless, to remodel a luxury home there exist certain materials that go perfectly with the concept, for example, metals, polished marble, worked wood, natural stones, among others. Incorporate mirrors with metal frames: the richness of the interior of a luxury house can be increased by placing large mirrors, which make it appear more spacious and give it better lightning, punctual aspects that don’t translate into big costs but that definitely add a strong luxury display. Install polished wooden floors: well-worked wood illuminates big rooms marvelously; also, using polished marble floors in light colors is extremely elegant. Replace a wall in the living room with a glass one: it is a great option especially if it leads to the garden because when you enter the room, you’ll be able to see the plants and the background, it’s a refreshing and luxurious concept. Renovate doors and windows: to modernize them you can leave behind those traditional designs and replace them with modern, smooth and well-worked woods; you could even metalize the frames so they look ostentatious. As you can see remodeling a luxury house takes more than just spending large amounts of money. You have to seek appropriate advice and at Dream Home Builders and Remodelers we’re more than happy to help you with your project and to help you achieve the desired result!